This is a continuation of "Locals Only" found in Website Magazine's October 2009 issue (available to monthly pro-level subscribers) and written by Tom Gray, @TomJGray. Because Google dominates the search field (both Web and local) the first place to list your local business should be Google and thier Local Business Center. Not only will this help consumers find your physical location, but also enhance search results for your business and help keep up with the competition. Once your presence is established and accurate, move on to build your local listing in other search engines, like Yahoo! and Bing. Start by going to maps.google.com/localbusinesscenter. Sign in with your existing Google account or, if you don’t have one, click on the Sign up now link. Once you’ve created your account, move on to the next step. Step 2: Add one or more locations. After you sign up or sign in you’ll be given an opportunity to Add new business or Upload a data file. Click Add if you only have a single location for your business or Upload if you have 10 or more locations. Google provides detailed instructions for creating this file. On the Add new business screen begin building your business listing with addresses and contact information. As you enter your address, you will see the map on the right zoom in on your location as it builds your listing. The last field to complete is a 200-character description of your business. Use powerful words (and keywords) that tell viewers what you do while they convey your unique value proposition. TIP: It’s not unusual for Google Maps to locate your business incorrectly. It placed one of my clients on a highway on-ramp 1.5 miles from his actual location. If this is the case with you, click on the Fix incorrect marker location link to make corrections. Step 4: Claim an existing listing or add your new one. The next screen gives you an opportunity to Add or Claim your listing. 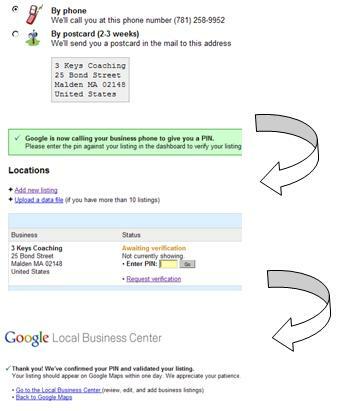 Google uses local business phone directories to populate its maps with basic information. Accordingly, your business might already be listed. In that case, select Claim Listing and follow the procedure. Click Add Listing if your business isn’t there or to add a new location. Step 5: Define how searchers will find you, and add pizzazz to your listing. • Categories: Begin typing and choose from the options presented or input your own. Think of how a potential customer would search for you (think keywords and phrases) and use these terms here. • Photos: Show off your store, gleaming restaurant or friendly staff to the best advantage with photos and other images (your menu, company logo, etc.). • Videos: Load up to five videos that put the spotlight on your business and personnel. • Additional Details: Add major product lines, special service offerings or off-street parking. Google, as do the other local search directories, requires that you validate your listing to ensure that you are the business owner. They give the option to do this by phone or mail. If you’re in a hurry (and who isn’t) I suggest the phone option. Google will use the phone number or address you provided with your listing to validate your information so be sure that the information is accurate and you have access to the phone. Once you select the phone option and click Finish you’ll receive an automated phone call within a few minutes. Google will give you a PIN to activate your listing. Enter your PIN as shown and ... Congratulations, you are now a few short hours away from attracting local customers to your business! • Impressions - how many people saw your listing as a result of a local search. • Actions - how many people took action by clicking on More info, your website or to request driving directions. • Search queries – what terms and phrases are generating activity. This is great information that will tell you where traffic is coming from and provide actionable insight into what’s working, so you can make adjustments to what isn’t. A great way for any business to attract new customers and generate repeat business is to offer coupons. The Dashboard provides an easy way to add coupons to your listings. Whether you offer a free initial consultation or a percentage off your most popular offering, coupons can be a great way to differentiate your listing from the competition. 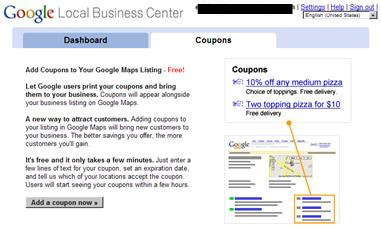 And coupons provide another feedback mechanism to show that people are finding you through local search.